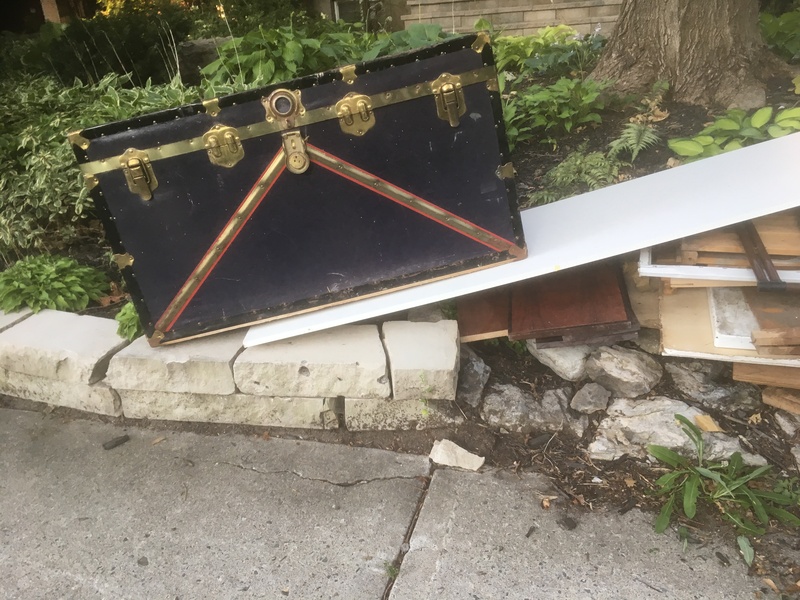 Late last week, on my morning walk, I saw an item out on my neighbour’s curb that reminded me of heading off to McGill University forty-five years ago. The navy blue, hard-sided box was fitted with a lock as well as some supporting struts wrapped around its width. Everyone I knew in residence came with a similar item – some had brought them across an ocean but most had come by land, carrying only a few possessions. Whenever I see one of these trunks, I am reminded that there was a time when I could carry everything I most needed in one relatively small trunk. We were only allowed to bring what fit into one trunk and one large suitcase to Royal Victoria College, the women’s residence at McGill University. Times have changed. This weekend, Postmedia had a very good article on the items a student heading off to college or university needs. My first thought was that these students are bringing many more things than could have fit into my old steamer trunk. This article does make the point that many students bring too much, spending an inordinate amount of time figuring out what is necessary. I can sometimes help students to figure out exactly what to bring because I see what things they find they need on an inpatient psychiatry unit and this often reflects what might be necessary when they leave home. Unfortunately, I do know a few young experts on life necessities in my practice – what is unfortunate is that these experts are housing insecure and they carry with them only the most essential things. They do have good ideas about the few things you really need. First, you need your favourite book, the one you read over and over, the one that contains the truths you most want to live by. I remember which book this was when I left for McGill. It was Le Petit Prince by Antoine de Saint-Exupéry, the French text, which fit so nicely into a pocket, which stimulated my best, expressive self. Secondly, you need a journal, or some way to document your own adventures in the new internal terrain you are exploring. I have all my journals, right back to when I first started writing. Sadly, I can say that, when I read them, I find my writing today to be only marginally better. I have lost my expressive courage and it seems to take a long time to get that back. The homeless youth I know keep both the book and the journal on their phones. Often, however, the book is a picture book, one small literary talisman from the time they remember that was not so bad that they couldn’t live at home. Whenever these youth find a book meant for a young adult or even a grown-up, I know that they have begun to find some better days in the present. With the more privileged young people heading off to college or university, helping them to figure out that one book is easier – and lots of fun for them. Finally, the best advice from the housing-insecure youth is to always have a way to make your favourite beverage. In fact, one young man pulled a tiny kettle out of his duffle bag and proceeded to describe where you can find plugs in the city. Most people heading off to college manage with packets of their favourite beverage – this is a great tip for a trip abroad also. Sometimes, when you’re feeling a bit homesick, there is nothing quite like the tea or hot chocolate that’s been a comfort for years. So, in fact, what a student must bring is the very few items that feed their soul. In the few years to come, what they will most seek is the even greater comfort of a thoughtful, intelligent mind and heart. If they have these, they can never be homeless, and what tangible items they most need will fit into a small trunk. There was a time when the US government could move all its papers in 12 trunks when they first set up in Washington. We have all been overburdened with stuff! What a nice article to focus on what is most important – home or no home! I too moved with one of those trunk! Great place to play cards on a rainy day as well! Guess every student today just uses their ipads or phones, so long card games with new friends at college is a thing of the past.